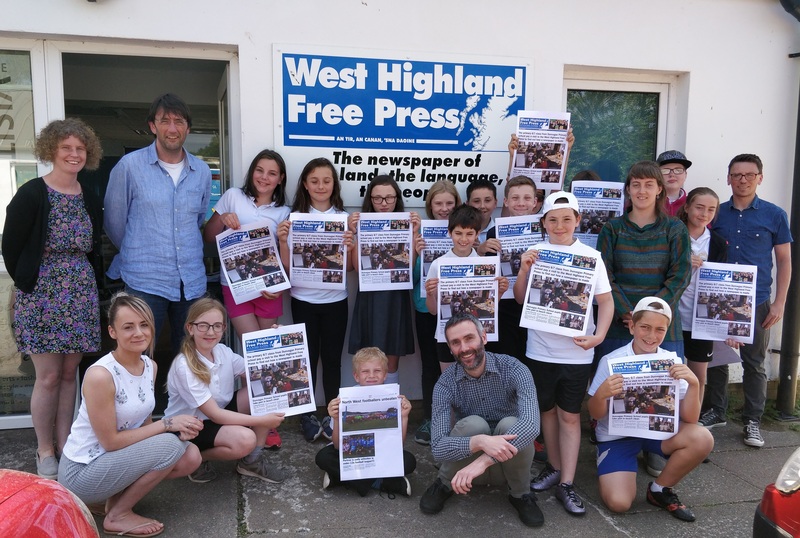 The Dunvegan P6/7 pupils – pictured with their teacher Ms Kater (right) and the Free Press Journalists – hold up their special edition front pages which they created during their visit. 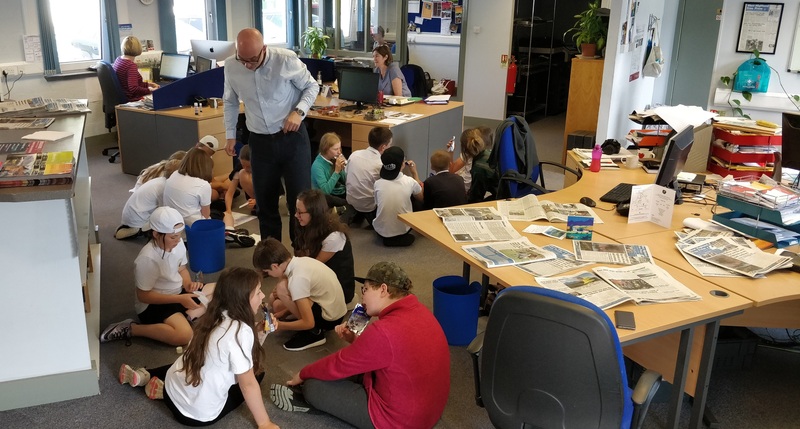 Pupils from the P6/7 class at Dunvegan Primary School joined forces with the Free Press team this morning (Thursday 31st March) for an informal tutorial on the process of putting together a newspaper. The pupils, who were there with their teacher Ms Kater, split into three groups, each led by one of the Free Press’ journalists: Keith MacKenzie, Michael Russell and Adam Gordon. The journalists gave the pupils an overview of the fundamental aspects of news reporting, such as who; what; where; when and why, as well as speaking about the importance of pictures, and a bit about the history of the paper. 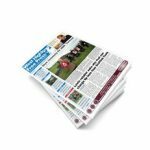 The pupils then went on to create their own news stories, which were typed up and sent through to the Free Press’ head designer Lesley Young, who showed them how to transform blank templates on the screen into vibrant and glossy newspaper pages ready for print. 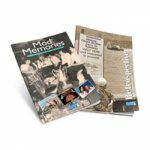 The Free Press Managing Director Paul Wood set the pupils the task of arranging adverts on a page – like a jigsaw puzzle – to help them understand how the pages were put together. Free Press Managing Director Paul Wood oversees the pupils as they tackle the jigsaw puzzle exercise. Keith MacKenzie and Michael Russell answered some questions from the pupils, such as how long the paper took to make, how many holidays journalists get, what the difference between a tabloid and a broadsheet was, and what the working week was like. 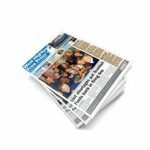 The children were then presented with their very own copy of a special edition front page of the Free Press which included a story they had written on a beach clean in Roag they had taken part in a few weeks ago, and they were also given a page with their sports story on the Skye under-13 football league.